We know how important lovely jewelry is to complete the look for your special day. 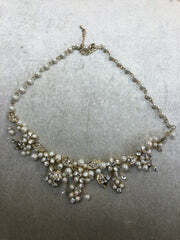 That is why we take great care in the selection of jewelry we carry here at The Persnickety Bride. We want our customers to feel and look beautiful, as well as be able to enjoy their purchase for years to come. Our buyers purchase quality pieces from respected manufacturers around the globe. We also love to work with US artisans whenever possible to help grow small businesses. Please feel free to reach out to us if you are looking for something different and unique. We are always buying new and different product so bookmark us and check our site regularly for updates.